This week Snapshot Thursdays is going to look a little different. 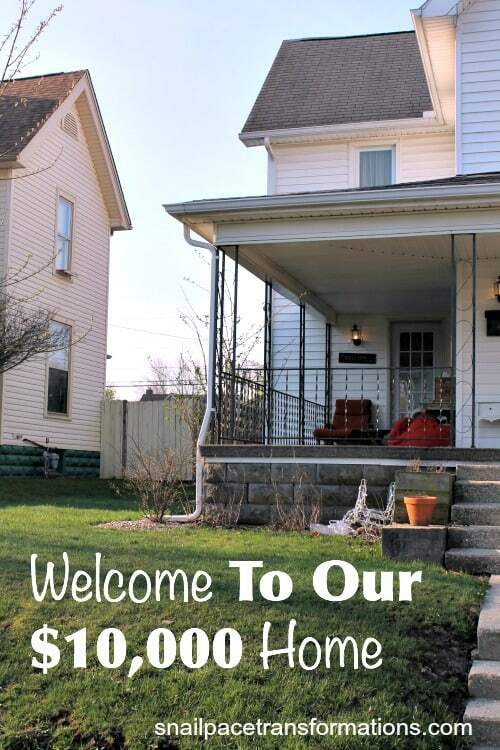 I have joined the Keepin’ It Real Home Tour & Blog Hop. When I read that Sarah of My Joy Filled life was going to be doing a homemaking challenge that showed what our homes really looks like I knew I wanted in. When I tell people that we purchased our home for just under $10,000 they immediately want to see it. So today I am letting you have a peek at what the living areas of our home look like; keeping it real style. I never want to be that blogger who makes it looks like she has is all together; because I don’t. So today I am sharing what my home really looks like on a good day. I say a good day because my husband, the cleaning ninja of our family, without knowing I was going to take these photos after I got home from a run surprised me by cleaning our home up while I was running with a friend. So today’s tour will be a little neater than a normal day. I want to mention 2 other things (besides an awesome husband) that are helping my home stay a lot neater lately . One my 52 weeks to a simplified home, is making our home easier and easier to pick up and make presentable. Two I am way past the toddler stage of life where everyone makes a mess and even if they do help clean it up they still make the mess again two minutes later, my kids are 12,14 and 19 and they help keep our home clean and keep it that way. Mom’s training your kids to help clean when they are little does pay off eventually trust me. This is the view you would receive as you stepped onto to our front porch and headed to our front door. That wicker couch, yard sale, the cushion, clearance. The lounge chair, thrift store, the cushion clearance sale. The table, left behind by a previous owner of our last house. The welcome sign; something I won in my MOPS days. Yes we believe in thrift around here. 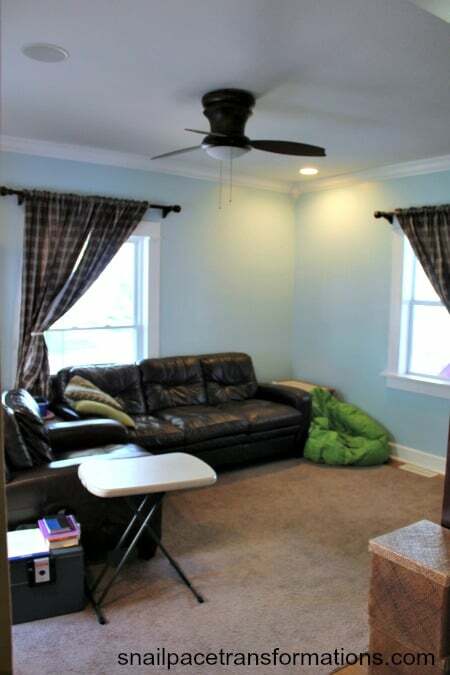 Even our home was a thrifty find costing just under ten thousand dollars. We spent forty thousand and two years fixing it up from top to bottom to be just how we wanted it. 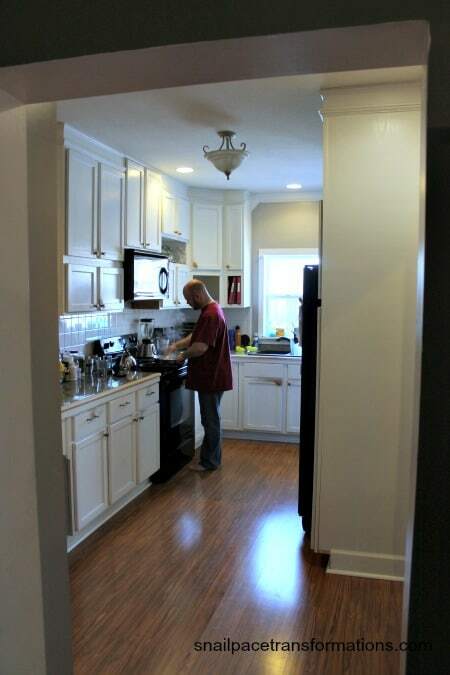 I had so much fun doing the renovations, it truly drew my husband and I closer together. This is the first room you will see as you walk in the front door. We call it our library. 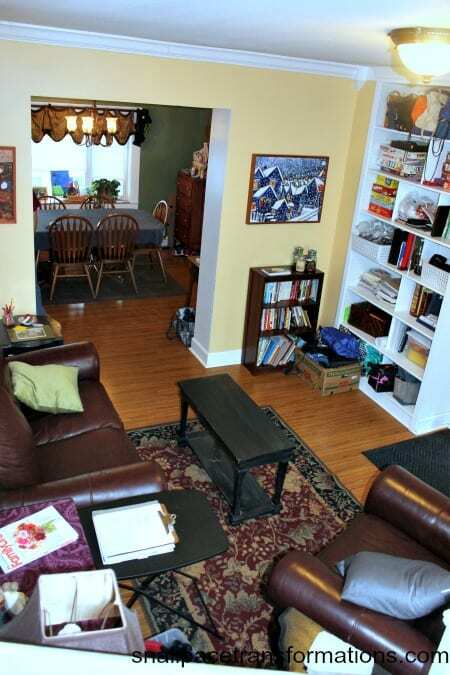 It can get cluttered really quick as we don’t have a coat closet nor a real defined area to put shoes and such. I make do with a big plastic tub for our coats (see the corner of it near the lamp) and laundry baskets for shoes. Oh and that banana box you see, it is full of stuff for the thrift store but I just haven’t put it in my car yet; which breaks my own decluttering rules. Oh and my hubby in the picture is making me a breakfast of fried eggs and hash browns. YUM. I am very blessed to have him. 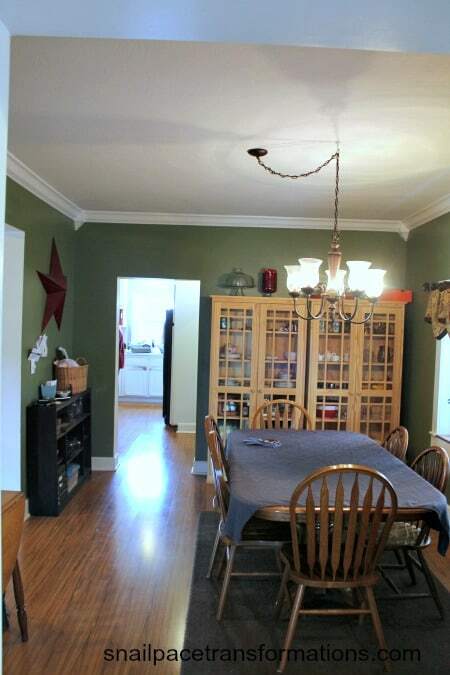 To the other end of the dinning room is our family room. Yes that is a safe on the ground it is a long story, but nothing is in it currently. The bean bag over in the corner is the dogs bed. Oh and those two baskets stacked up on top of each other is actually where we store all our socks. Yep, all 5 of us share socks. We all have the same sock size. Years ago I got tired of sorting socks, so I went out and bought 2 dozen black socks and 2 dozen white socks and now I just stuff them in those boxes for people to grab them as they need them. It works for us. That makes up the living areas of our home. It isn’t large but it is big enough for our family of five; plus we own it 100% debt free and that makes it awesome. As a homemaker I work hard at making it a home. It took every thrifty trick I had to decorate it and stay within our budget. It takes all 5 of us working together to keep it clean. I wanted to share with you just one more spot on the front porch. My favorite spot. 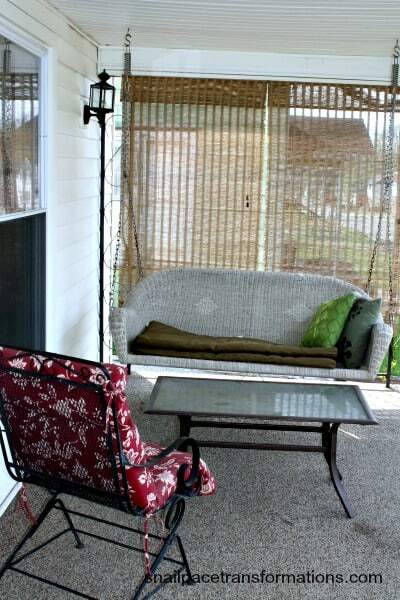 If you lived near me and asked me to spill my homemaking secrets I would take you out front to sit on the swing porch a while and discuss what has worked form me and what hasn’t. I would also want to hear what works for you too! In this busy world though there isn’t enough time to sit on front porches, sip sweet tea and share wisdom with one another, so instead before you leave let me share some of my favorite books that have helped me with my homemaking skills over the years. For cooking help nothing is better than the classic Better Homes and Garden 3 ring binder style Cook Book. It has all the instructions you need to cook great meals from scratch. For time management I really like Don Aslett’s book How To Handle 1000 Things at Once. It was written in the 90’s but the wisdom in it is timeless. 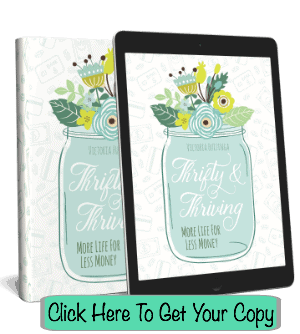 If you feel like you are lost in the trenches of motherhood Say Goodbye To Survival Mode can help you find your way back to living a passion filled life. Thanks for visiting our home and hope you come back soon! Stay in touch by joining me on Facebook. 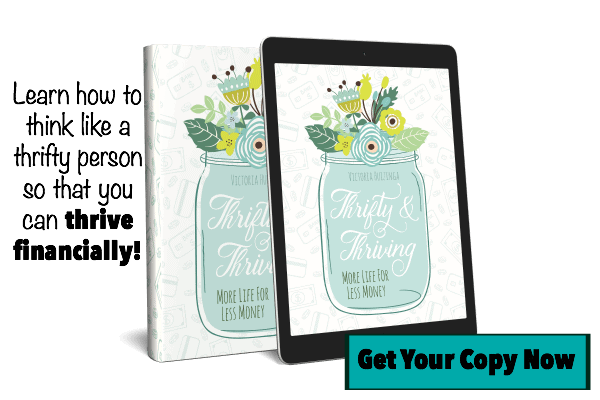 Available in paperback and Kindle on Amazon–get your copy here! 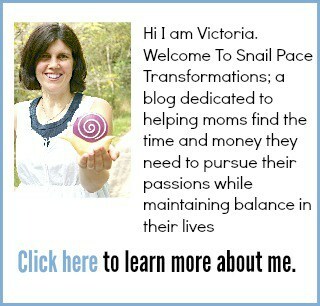 Get snail-e-mail in your inbox each week! A weekly email with the feel of snail mail. A peek into my week, a few deals so good I just have to share, and links to all of Snail Pace Transformations latest posts! Your home is beautiful! I am in the toddler stage right now (1, 2, and 5 year olds), so it is encouraging to think that soon I can have a clean house! Ages 1, 2, and 5 are a hard age to keep the house up. Hang on though I found that once the last one reached school age they became a lot more helpful at cleaning messes, and also started making less messes too. $10k for a house? Wow! You guys are amazing! 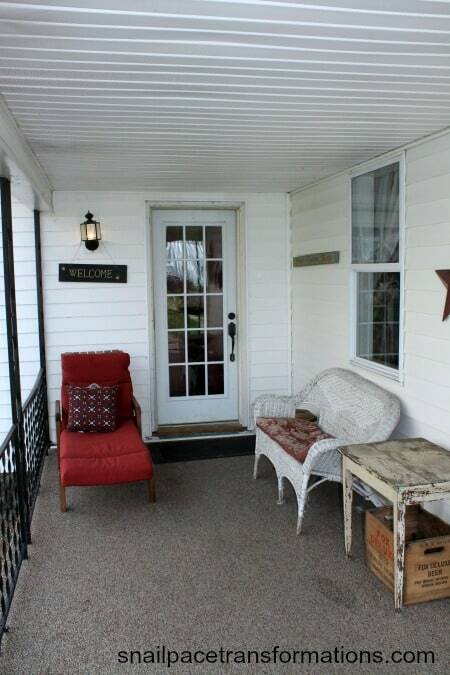 I’m completely in love with your kitchen and your porch! You guys did a great job with your house and I agree- I’d happily spend 2 years renovating a house if I could pay 10k for it! Awesome for that price! We are doing a similar thing right now, and we are in the inbetween stages… living with the inloves while we do the massive remodel, but it will be so worth it! The remodeling stage can be stressful but also so much fun. I loved getting to decide what finishes I wanted and where to put cabinets and such (budget considered of course). I LOVE the fact you all share socks. I find it both hilarious and awesome and I can totally see it saving a lot of frustration and time in the laundry department! My spouse and I wear totally different socks (dress socks, thick wool socks, gym socks, black ankle socks), but I sometimes steal my spouse’s old ski socks to wear for hiking. That’s the only sock sharing we’ve worked out, and there’s a reason I use the word steal! Yes my sock idea doesn’t work well for couples who wear more formal clothing than we do. We can get away with white and black athletic ankle socks for pretty much everything except for my son who plays soccer we have soccer socks for him stored in another area. Bravo! I am so happy you shared a real home, I love it! I look at some homes and wonder, who the heck lives there?! How did they stage that?! Will someone show us a real home that real people live in?! I also love your sock idea. I have seriously considered putting shelving in the hall with socks in baskets so we all can share, now I am going to do that. Our sock basket has saved me so much time! It truly is worth doing. What a deal on your house. We have a 22 year old ranch house with a basement that we bought two years ago as a short sale. We have been doing lots of renovations. We love the house, but at nearly 4000 square feet, it will be too big when my mother is no longer with us and my kids are out of the house. (my son has already moved out and my daughter is in college) Our plan is to sell and take our likely $100K profit and buy another fixer with cash. We will then cash-flow any renovation. The goal is to be completely debt free. Love it. That is a great goal. No secret really. We live in an area where there was a lot of factories, but many closed down years ago and older homes are plentiful as many couples don’t want them;they want something newer with less work to do. We did put 2 years of work and $40,000 in repairs into the home, but the purchase price was indeed just shy of $10,000. What also help I guess was the home was full of junk and we had to haul it away, plus it is in a so so neighborhood, safe enough but not as pretty as newer neighborhoods. I love it…we also have homes here for that price. It’s nice to be able to buy a home for an affordable price. You have done a wonderful job with renovations! Truly amazing! You’re a hardworking blessed woman! My husband is a cleaning ninja too! We are so lucky! Love the concept though… I can’t wait for my own messy home tour tomorrow! I love your $10,000 house! Were you able to live in it while renovating it? Thanks and no we did not live in it while we renovated it. It was a total gut job. I think there are perhaps 4 original walls in the whole place.